LOCATION: The Calvin Seymour Cemetery is located in the W/2 of the SE/4 of SE/4 of Section 13, T6S-R9W. It is two miles southeast of the Latimer Community as the crow flies, and about six miles NNW of Ocean Springs. DIRECTIONS: From the intersection of Bienville Boulevard (US 90) and Washington Avenue at Ocean Springs go north on Washington Avenue 2.9 miles to Interstate 10. Cross the Interstate and bear left onto Tucker Road. Go 3.18 miles northwest on Tucker Road to Old Biloxi Road. At Old Biloxi Road go north a few hundred feet and see Jim Ramsay Road to the right (east). Turn right onto Jim Ramsay Road and go 1.93 miles to Jim Ramsay Road Cutoff. Go left (north) .36 miles to the Seymour Cemetery. It is located on a high ridge surrounded by a trailer park owned by James Seymour. 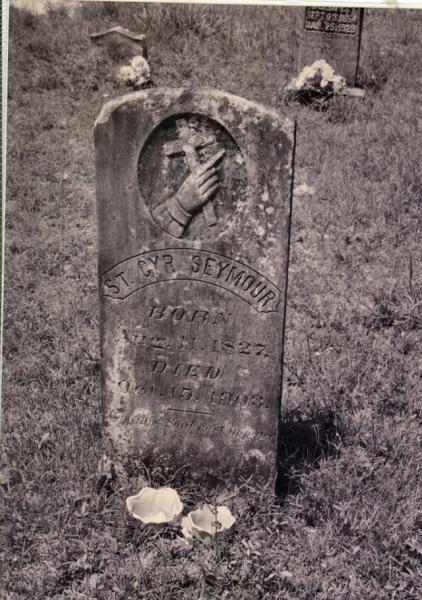 HISTORY: Calvin Seymour (1850-1922), the son of St. Cyr Seymour (1827-1903) and Anne McCarty (1832-1872), married Elizabeth Mulholland (1859-1936) in 1873. Her parents were Irish immigrants, James Mulholland (1823-1871) and Margaret Mayers (b. 1817). The Mulhollands were merchants and owned several hundred acres of land in the area. They probably settled on the Old Biloxi Road on the south side of Cypress Creek. This forty-acre homestead is located in the NW/4 of the SW/4 of Section 3, T7S-R9W, and was acquired from T.N. Ginaganan in July 1858 (Jackson County Deed Book 17, pp. 370-371). James Mulholland also owned the N/2 of the NW/4 (1859) and the NW/4 of the NE/4 (1867) of Section 3 (Jackson County Deed Book 17, pp. 368-371). In addition, he had forty acres in the SW/4 of the SW/4 of Section 35, T6S-R9W (Jackson County Deed Book 17, pp. 370- 371), and 200 acres of land in Section 20, T6S-R9W, a few miles east of the Seymours. Elizabeth Mulholland Seymour's brother, Jefferson Davis Mulholland (1861-1930), was active in banking, real estate, seafood packing, and construction in the North Biloxi area during his lifetime. About 1885, The Calvin Seymours homesteaded in Section 13, T6S-R9W, a few miles southeast of the Latimer Community of west Jackson County. Here they reared a large family of nine children of which seven survived: Annie Dora Havens (1874-1965), Leanead M. "Nead" Stone (b. 1875), James Seymour (1878-pre 1900), Peter Edgar Seymour (1880-1943), Carmelious "Camille" Seymour (1883-1945), Joseph Jefferson Seymour (1885-1902), Rose Elizabeth "Nora" Hunt (1889- 1913), and Agnes Cleo Barthes (1894-1918). By 1904, Calvin Seymour owned at least 280 acres in the vicinity of his homestead. He made a lease with the N.W. Smith Company in October 1904, for the chipping, scrapping, barking, and otherwise for the manufacture of turpentine and rosin using all the pine timber on the following lands: NW/4, NE/4 of Section 24, SW/4, SE/4 of Section 13, SE/4, SE/4 of Section 13 (all T6S-R9W), and SW/4 of Section 18, T6S-R8W (Jackson County Deed Book 29, pp. 120-121). Before his death in 1922, Calvin Seymour sold his son, Carmelious, the following lands in T6S-R9W: SW/4 of the SE/4 of Section 13 and the W/2 of the SE/4 of the SE/4 of Section 13, less 1/2 acre for cemetery purposes. Said land contains 60 acres less 1/2 acre for cemetery purposes (Jackson County Deed Book 38, p. 423, August 23, 1912). Carmelious Seymour (1883-1945), called Camille, built a home just west of his father's place in 1907. The house is extant but in poor condition. It was built as a raised cottage on a "lighter" pine foundation, which has sank over the years. The hip roof is well rusted. The original Seymour home had two bedrooms, a living room, and an L-shaped gallery. The kitchen was added later. On this upland piney woods land, Camille Seymour made his livelihood by farming. He supplemented his income by cutting select pine trees for wharf and bridge piling. During the depression, Seymour "turpentined". Camille Seymour married Daisy Caldwell (1888-1966) about 1906. They reared seven children: Floyd A. Seymour (1907-1973), Lorraine Daisy Smith (1912-1999), Harold Camille Seymour (1914-1994), Louise Leanead Page (1915-1993), Jeff Seymour (1918-1992), James Clifton Seymour (b. 1922), and Donald Wallace Seymour (1927-1948). In April 1942, Carmelious Seymour (1883-1945) conveyed the cemetery tract and the SW/4 of SE/4, Section 13, T6S-R9W to his wife, Daisy Caldwell (1888-1966), and sons James and Donald Seymour (Jackson County Deed Book 79, p. 605). After the death of Carmelious Seymour in 1945, Daisy Caldwell Seymour married Chester Gibson of Taylorsville, Mississippi. 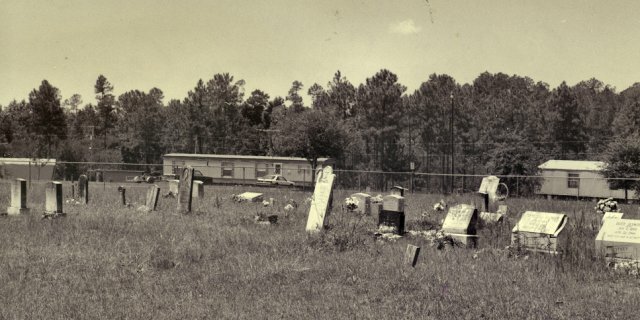 In May 1974, James Clifton Seymour, the son of Carmelious Seymour, and his wife, nee Doris Hargrove, quitclaimed the following described parcel of land to be utilized as a cemetery for the living heirs of J.C. Seymour, deceased, and Zeslide (Zeolide) S. Deloney, deceased: A plot of land in the SE/4, of SE/4 and SW/2 of SE/4 of Section 13, Township 6 South, Range 9 West, in Latimer Community, Jackson County, Mississippi, being further described as: Beginning at a point 351 feet South and 85 feet East of the NW Corner of SE/4, SE/4, Section 13, Township 6 South, Range 9 West; run South 417.6 feet; thence West 104.4 feet; thence North 417.6 feet; thence East 104.4 feet to the point of beginning. Contains 1 acre, more or less. (Jackson County Land Deed Book 500, p. 338). The Calvin Seymour Cemetery is located here today. d/o Mr. and Mrs. H.E. Brodnax, Sr.
Jerome Lepre, The Delauney Family, (Brother Jerome Lepre, S.C.: New Orleans-1988), pp. 127. Mississippi Coast Historical & Genealogical Society, "Wells-Mulholland Cemetery", Volume 27, No. 1 (February-1991), p. 16. Jackson County, Misissippi Chancery Court Cause No. 2, "Estate of James Mulholland", January 26, 1876. The Daily Herald, "A Correction" (Jeff Seymour Obit), January 5, 1902, p. 1. The Daily Herald, "Mrs. A. Hunt Dies in New Orleans", December 31, 1913, p. 2. The Daily Herald, "Jackson County Land Mark Dead", December 16, 1922, p. 3. The Daily Herald, "Carmelious Seymour Dies", March 16, 1945, p. 9. The Sun Herald, "James Clifton Seymour", July 15, 2009, p. A4. The Sun Herald, "Bertha Broadnax", July 21, 2009, p. A4. The Sun Herald, "[Bertha] Broadnax kept positive outlook", July 22, 2009, p. A4. The Sun Herald, "Mr. "Doc" Armstead Brodnax", June 8, 2010, p. A4. The Sun Herald, "Doris H. Seymour", September 8, 2011, p. A4.